Discover the tarot through history and pop culture. 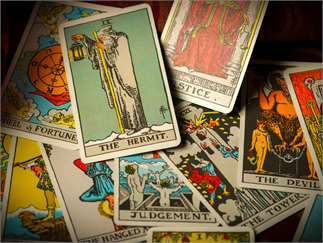 Discover the tarot through history and pop culture, plus tips for your own tarot readings.The tarot has been used for anything from card games to fortune telling to problem solving. Learn how this 78-card deck developed and changed over time, hear the stories it has inspired, and gather ideas for your own Fool's Journey. Sara Q. Thompson collects tarot decks and cover songs for similar reasons: to follow the same piece of art through expressions by different people. She has worked in libraries for twenty years, but she's trying very hard not to collect any more books.